Welcome to my world, the weird, wonderful, wacky world of Mulleneaux. This blog is my inner thoughts about art, painting and sculpture. As most of you know, my art is a little off kilter. My blog may be a little off kilter too. I hope it is a fun spot to get fresh inspiration and bring smiles along the way! Life is funny –you never know where it may take you. Friends always see your strengths quicker than you do. Where would be without friends? This year has been a new adventure! For many years I’ve given to local animal shelters and they continue to be a passion. Late last year, a friend invited me to design a 3D Dog Sculpture for the Arizona Humane Society. Her vision was for the sculpture was to be given to local artists to finish in their own style. Each piece was auctioned at the Arizona Humane Society’s annual fundraising event “Compassion with Fashion.” The “Petcasso Collection” was a wonderful success! Earning the AHS over $12000.00. Another friend suggested I continue this theme by creating the Dog Sculpture as a holiday ornament. This limited edition, stainless steel ornament has the Arizona Humane Society logo and a fun bones and paw print pattern engraved on both sides. Each Dog comes with a collar and tag signifying they have found a home. All proceeds benefit the Arizona Humane Society helping many homeless pets find their forever homes too. 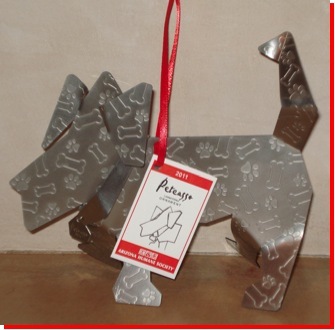 These ornaments are only available at the Arizona Humane Society’s stores: Petique, Petopia, Pet Emporuim. For additional information and locations visit the Arizona Humane Society shops. I’m new to blogging. It may take a few posts to get a rhythm going. I would sure enjoy hearing your thoughts and advice.